A 1-In-100 Blogger: Obama's Private Army Courting TSA? Obama's Private Army Courting TSA? Obama's private army has found another opportunity to take advantage of a poor security policy, unions are now courting TSA for a potential takeover. Unions want to replace TSA as the new security personnel for airports within the United States. I have a prediction, too, on which union is courting TSA. It's got to be a union which has the backing of Barack Obama and has a goal to become a national civilian military force. The last time such an opportunity arose was following an incident in downtown Seattle, after surveillance video caught security personnel do nothing as they watch a 15 year old girl get beaten and mugged in a transit tunnel. It was Obama's SEIU shock troops who quickly jumped on the chance to unionize Seattle's Transit Tunnel security. If the SEIU would attempt a takeover of Seattle's Transit Tunnel security in their goal to paint the nation purple, surely these union bosses could also see that a unionized TSA under the umbrella of Homeland Security is their best opportunity to gain power as Obama's civilian military force. This is as much of a play on the TSA as it is on you! Make the people hate the TSA and then the TSA employees are going to beg for somebody to protect them and represent them. And they'll run right into the arms of the union. This story just gets more interesting, and I'm sure rumors may run wild until all is revealed. We live in very weird times. 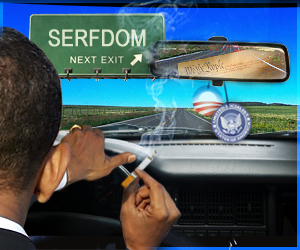 The post-Obama era, perhaps this is what it's like to be on the Road to Serfdom. Very odd, indeed. So I'll leave you with this short segment from The Glenn Beck Program. Czar-At-Large Brian Sack takes a look at the new TSA guidelines. Czar-At-Large is a weekly production made exclusively for the Insider Extreme. TSA: Wanna Fly? Drop Your Fly.